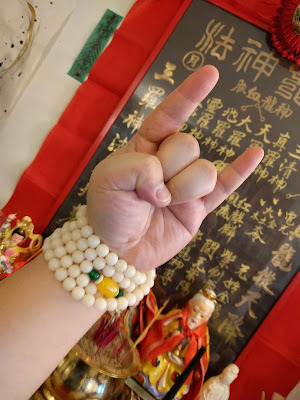 I am Mak Jo Si (Jee Sifu) who is a professional in Chinese magic (sorcery) and exorcism etc., This site will be mostly introducing you the Chinese magic of Saam Law Sun Gung 三羅神功. We are also on YouTube's "Tin Yat Dragon" channel! When I was a kid, I always fancy the Taoist magic hand seals, because htey look cool and they are very powerful - at least in the movies. But what does it really do and is that really how it works in real life? Now I can tell you what the real deal Taoist magic hand seals are like and what they do! I know your feeling when you come into this post, you are expected or wanting to find tutorials and guides on how to do it yourself and so you can jsut "grab and use them". Sadly, the hand seals needs a master to pass on the power to you, and so he can program it for you, and inherit you the power. You must be ordained as a Taoist in the specific lineage to get the hand seals that the lineage have. Which means, if you ordain into Saam Law Taoism, you get to have the power for Saam Law Taoism and not other sects. So your hand is like a remote control and your master will program the buttson for you and teach you how to use it and why we program it that way etc. After you have got the powers inherited, then your hand seal is activated and usable. Therefore, you must be a disciple in order to get them to work. 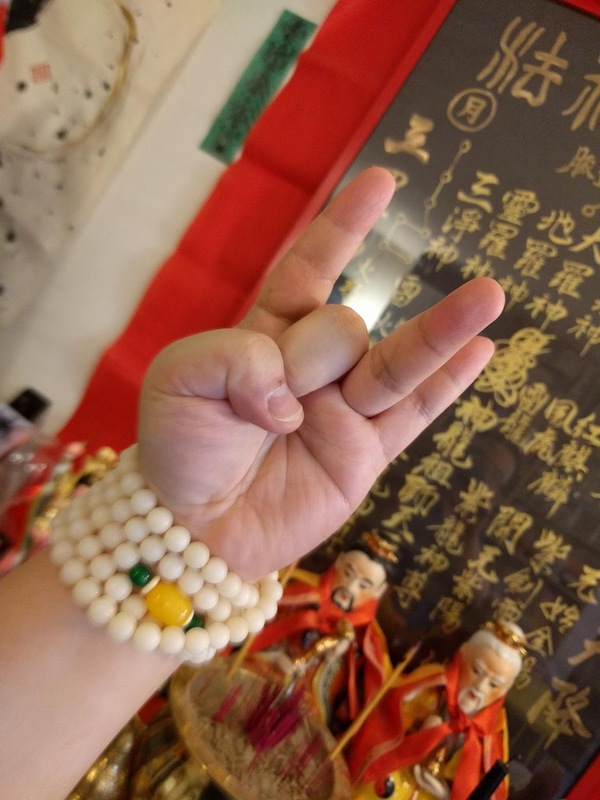 Here we will talk about the three basic and powerful hand seals and let you know the purpose of them and how we use them in real Taoist magic work. 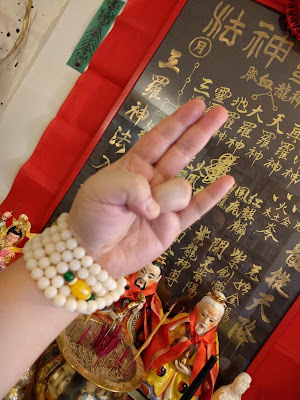 The first Taoist magic hand seal is called the TAO hand seal, DOE JEE 道指 which is used to push things to absorb something, or to transfer something ":into" the subject and make them absorb and intake it etc. This, for example, can be used to infuse spells and empowerments into people or things. Sometimes, you might have done a magic incense and you forgot to dump a few spells in, no worry, you can use this hand seal to pump tem in too. The main power of this TAO hand seal is to have the other party to absorb while you transfer things over. The second hand seal here is called the GING hand seal, 經指 GING JEE, which is a processing power handsign. You can command the subject to make changes internally and also tweak their inside. It's like as if you treat the subject as a human being and this will allows you to change their organs, and tweak how their system operates. It is very powerful, because you can be using this hand seal to exorcise crap out of their system too. If your mindset is very evil and bad, you can also use this hand seal to harm people, imagine you are a bad guy trying to do "surgery" on people while messing their organs up... So here is the hand seal below. The last hand seal is called the SI hand seal, or the SI JEE 師指, and this is like an instructor hand seal, it pushes the subject to move and do things or start things up. You can say it is like a force that injects to things and force them to do what is instructed and "start" the work immediately. When we are communicating with our guardian statues for example, we will use this hand seal to command them to do work for su. The GING hand seal only helps you input the details of what is to be done, and you can make changes to the details, but this SI hand seal act as the command and start button, so it will push the subject to start doing the work. When there is magic attack coming your way, the other side wnats to force you to do something, such as jump out the window and suicide... when you encounter that, you can be using the double SI hand sign to push it back to them and so they will eat their own medicine back. How powerful and cool is that! After learning about these hand seals, you might wonder, how is it used and how are the magic work done in Taoism? Well, here we have video on our YouTube channel showing you how its done! Many different hand seals are used in a ritual and they are not easy to understand and master. Let's get to it and watch the Taoism exorcism video! In case you need help with exorcism and is searching for a Taoist master who can handle your case by distance, Tin Yat Dragon is here to help.